Sovrum 1 med dubbelsäng och inbyggda garderober. Sovrum 2 med singe sängar, 1 med utdragbar säng för att sova tredje person. Lounge med stor bekväm soffa, 42 "TV, Full Wi-Fi internet, (gratis) Sky TV, DVD-spelare med urval av DVD-skivor, dessutom finns en hårddisk med över 200 block buster filmer, både för barn och vuxna. Matbord med ytterligare uteservering tillgänglig. Kök med spis, mikrovågsugn och kyl / frys. Tvättstuga med strykjärn och klädhäst tillgänglig. Badrum med dusch, bad, toalett och handfat. Lounge dörrar öppna på terrassen, privat gated trädgård och direkt tillgång till 3 pooler. Barn anläggning att inkludera barnsäng, barnstol, baby monitor och push-stolar. Detta komplex är privat, säkert gated med entré via knappsats tillgång, har privat parkering på plats och ligger i ett litet samhälle med 20 fastigheter. Clean, private, perfect for relaxing. Just returned from our second stay at this home from home. We travel with just hand luggage so great to have washing machine for a quick wash during the holiday. Beds really comfy and double is a big double so plenty of room. Everything you need to cook is in the kitchen with milk, butter, bread & water supplied on arrival - which was lovely. 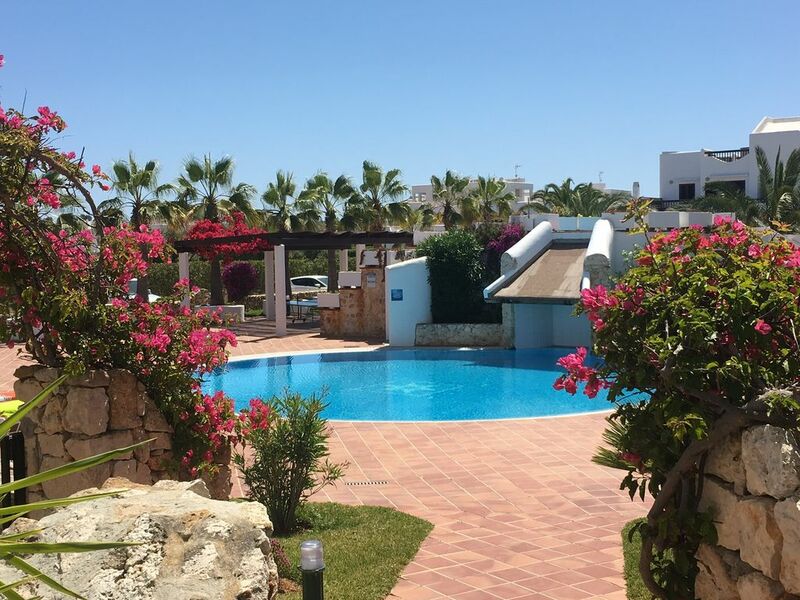 Walled garden with plenty of room for four sunbeds means no fighting for a bed and only 10 metres from poolside. Cala Egos shops and restaurants are 2 mins walk away and Cala D'Or Marina is 10 mins walk where you can walk around the marina to Cala D'or (or a 5 euro taxi ride for four). Lovely area as a base or do as we do and just chill by relaxing in the garden / pool and eating far to much every day in the local restaurants. Jarvis is always on hand for questions before and during holiday. So glad I found this gem of a property and would have no hesitation in recommending it. This is a fantastic apartment! We have stayed twice now in Casa Helena and have thoroughly enjoyed it. We stayed in the garden apartment which is just perfect for us, having two boys aged 11 and 8. They loved the pools, table tennis and playing with the other kids in the complex. The apartment itself is spotless and has lovely furnishings, everything you need for an easy, relaxed holiday with kids. The owner Jarvis is so helpful and friendly, answering any emails or queries promptly. I would have no hesitation recommending Casa Helena to my friends and family. We have had two family holidays here now and will definitely be returning in the future. We have just returned from our second visit to Casa Helena and have booked again for next year. The apartment itself is clean and well equipped and is within a gated complex of around 20 properties. The kids loved the pool area and played happily all afternoon with friends they made leaving myself and my husband free to enjoy the peace and soak up the sun ! Cala Egos has several good restaurants and a well stocked supermarket. The marina at Cala D'or is a 10 minute walk away , you can amble round looking at the boats into the town itself. Jarvis the owner is very easy to work with and always replied promptly to any queries. I would recommend Casa Helena to anyone wanting a holiday in Majorca. From our first enquiry to our stay the owner Jarvis provided an excellent service with prompt and informative advice. The cassa Helena was very clean with very good facilities within the cassa with everything you need. There were other families staying in the other villas but this only made the stay better as they were very friendly and gave a neighbourhood atmosphere but still quiet at night time. The outside gardens and pool area are excellent and very well kept. The grounds are also secure with private parking all inside electronic gates. The photos do not do it justice. The shops restaurants and beach are all within a two minute walk and cater for all ages. The area of Cala Egos and Cala D Or is very picturesque and friendly I will go back as one week was not enough time to explore this excellent location.